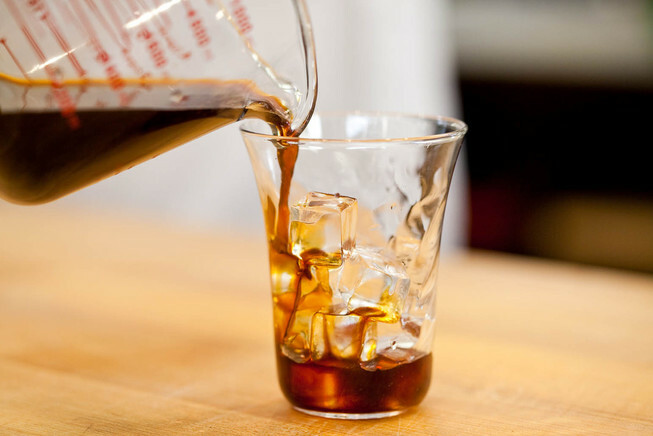 On the heels of our recent post about our well-loved New Orleans style iced coffee, we have been fielding some questions about how to cold-brew coffee at home. In the warmer months, many people look for an alternative to their usual hot coffee, but there are a few other benefits to cold-brewing coffee at home. First of all, it’s easy: a little measuring, a little waiting, and you’ll have a pitcher of coffee that will last for up to a week. Secondly, and more significantly, cold-brewed coffee is much lower in acidity than traditionally brewed coffee. This makes it an excellent alternative for coffee drinkers who are sensitive to acidity – either as a matter of personal preference, or upon the doctor’s recommendation! Pour a little water in and let the coffee 'bloom' for 10-15 seconds. Pour-over coffee brewing is our preferred method for making coffee at home. You’ll find a fuller flavor in your cup, as this brew style allows for a more complete extraction than a standard automatic coffeemaker, for example. Making a great cup of pour-over coffee at home isn’t difficult, and with some finesse, you can master the process and brew a truly high quality cup of joe.